You can can transform a flat, tar roof into a lovely outdoor haven with container plantings. A well-planned rooftop garden can also provide habitat for local wildlife and mitigate storm-water runoff. Here's what you need to know to start one of your own. It goes without saying that in order to grow a roof garden, you must have a roof. But many city dwellers either rent or own an apartment in a shared building, and roof rights are not always included. Before you do anything else, be sure to check with your landlord, co-op board, condo organization, or building superintendent to determine what, if any, roof access you are granted. If you skip this step and try to surreptitiously plant containers on your roof, you are likely to regret it. An angry landlord or super may drag all your hard work to the dumpster—or worse, you may ﬁnd yourself liable for damage or injury. At the same time, learn as much as you can about the roof’s general condition as well as any upcoming maintenance requirements. This may be the year your roof is scheduled for repainting, for example. You don’t want to invest in expensive and hard-to-move planters or other structures that the roofers would have to clear away. Once you’ve secured your roof space, assess the site just as you would when establishing a ground-level garden. You’ll also want to plan how to address various site challenges. Make note of the site’s light exposure. Most roofs receive full sun (more than six hours of direct sunlight a day), but if yours is shaded by neighboring buildings most of the day, you’ll be better off growing shade-loving plants. If your roof is painted black, it will be signiﬁcantly hotter than a white or silver roof—black roofs in New York City can reach 170°F on a very hot day—and you’ll need plants that can survive such scorching temperatures. During the growing season, most rooftop container plants need daily watering, so a rooftop water supply is essential. Many gardeners use drip irrigation fed from roof-level spigots because of the intense watering needs of wind- and sun-exposed roof plants. If there’s no spigot, you could place a rooftop rain barrel on your roof, but before you do, take into account the weight of a full cistern, ﬁnd a secure place to put it, and clear it with your landlord or coop board. If neither of these is an option, you may be left to haul watering cans up from your apartment. If so, it might be impractical to grow more than a few plants. Of course, succulents and other drought-resistant plants can go longer between watering and thus lighten your workload. No matter what type of plants you use, plan to place rubber mats, wooden decking, or some other buffer beneath your containers to help them drain more efﬁciently and protect rooﬁng materials. Wind-catching plants like trees are likely to topple over in high winds, especially if they’re planted in top-heavy, vase-shaped containers, so use square planters instead and position them against a windbreak. Unless they’re well sheltered and staked, long-stemmed ﬂowers will be battered, so consider growing shrubs and low-growing ﬂowering plants instead. Lightweight lawn chairs, gardening materials, watering cans and tools are liable to take ﬂight in windy weather (and possibly injure someone in the process), so be sure to completely secure all your rooftop furnishings and supplies. No matter what you intend to plant, lightweight growing medium is a must for any rooftop garden to help reduce its overall load. Bagged soils marketed as container mixes, available at garden supply stores, tend to contain sphagnum, perlite, and vermiculite, which are lighter than garden soil and also help retain moisture and provide aeration. Look for plastic or lightweight wooden planters and pots rather than heavier terra-cotta or concrete ones. Commercial sub-irrigated planters like EarthBoxes can be an especially useful option for rooftops. Also called self-watering planters, they contain reservoirs that can help stretch the time between watering. Budget-conscious roof gardeners can make their own planters out of wide range of repurposed receptacles like children’s wading pools, plastic buckets, and recycling bins with holes drilled in the bottom for drainage. Some gardeners even have good luck with old coffee cans or heavy-duty plastic shopping bags. For vertical plantings, consider trellises, pergolas, or commercial hanging systems, like Woolly Pockets, that can be installed on walls. Once you’ve assessed your roof site and planned your approach, the fun begins: You can now choose your plants. Drought- and heat-tolerant plants are most likely to do well in windy and dry rooftop conditions, but you needn’t stick to low-growing succulents. To a large extent, learning which plants are most successful on your roof is a trial-and-error process. Almost anything, aside from large trees that demand extensive space for rooting, can grow well in a container, but your particular site conditions will play a large part in determining which plants grow successfully there. Here are some things to keep in mind. Consider growing drought-tolerant species native to your region. Native plants are prime attractors for local wildlife, so even the most humble rooftop container garden can become a habitat for local pollinators and birds. Veteran roof gardener Ellen Spector Platt, who presides over a garden of more than 75 containers on the roof of her Manhattan high-rise apartment building, frequently spots butterﬂies, songbirds, and pollinating moths ﬂitting through her garden—18 stories above street level. At the same time, Platt, who was once in charge of a ﬁve-acre farm in Pennsylvania, appreciates how the location protects her garden from unwanted predators. “Up on the roof, you never have to worry about deer nibbling your plants,” she says. Many small ornamental trees and shrubs like river birch (Betula nigra), serviceberries (Amelanchier species), and Japanese maple (Acer palmatum) do quite well in rooftop gardens if they’re planted in large, stable containers and protected from the wind. This will add substantial weight, however, so be sure to determine whether or not your roof can bear it before you invest the effort and expense. After a few years you may need to do some root trimming to keep your plants to a manageable size. Plan on dedicating some time in the warm months to weeding and deadheading. Check your plants carefully for insect pests and diseases—early detection can help you avoid the need for chemical intervention. Beware that windy rooftops are often host to volunteer plants—mugwort, clover, or even a feral maple may try to establish themselves in your containers. Remove dead leaves and other detritus before they clog your roof’s drain. Just as rooftops are harsher climates than ground-level gardens in spring, summer, and fall, they can be extremely bleak environments during the winter. Do some research to ﬁnd out what your plants will need for winter protection. Some smaller plants can be brought inside, and large perennials should be winterized with extra mulch. Woody vines and shrubs like American wisteria (Wisteria frutescens) and arborvitae (Thuja species), as well as containerized trees like Japanese maple (Acer palmatum), ﬂowering plum (Prunus triloba), and river birch (Betula nigra), usually overwinter well with protective wrappings of burlap or plastic. 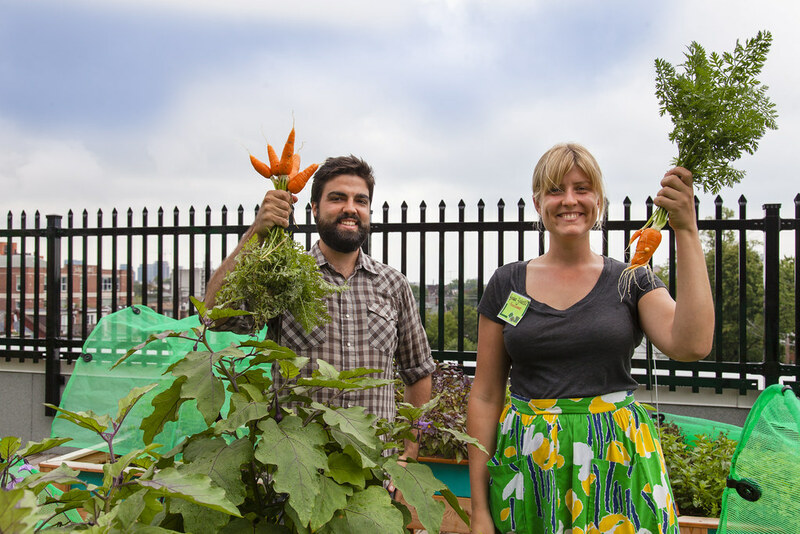 Sunny rooftops can be great spots to grow edible plants. Many vegetables, herbs, and fruits are annuals, so you can try different varieties and cultivars each year. They’re also great plants to share with your neighbors. Roof gardener Platt cultivates a “pinch an inch” patch of lettuces and herbs and invites everyone in her building to collect from it. One year she grew peanuts, much to the amazement and education of the city-dwelling children in her building, who had never conceived that this snack food comes from a plant. 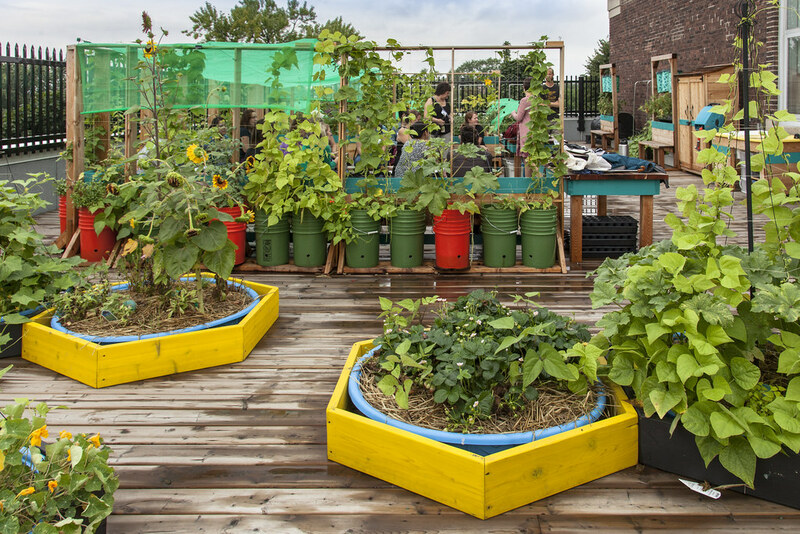 Anything you grow to eat on your rooftop should be carefully washed beforehand: Just like streetside and backyard urban gardens, urban rooftops—particularly those near major roadways—receive airborne pollution. You don’t need a lot of space to create a container garden worthy of guests. 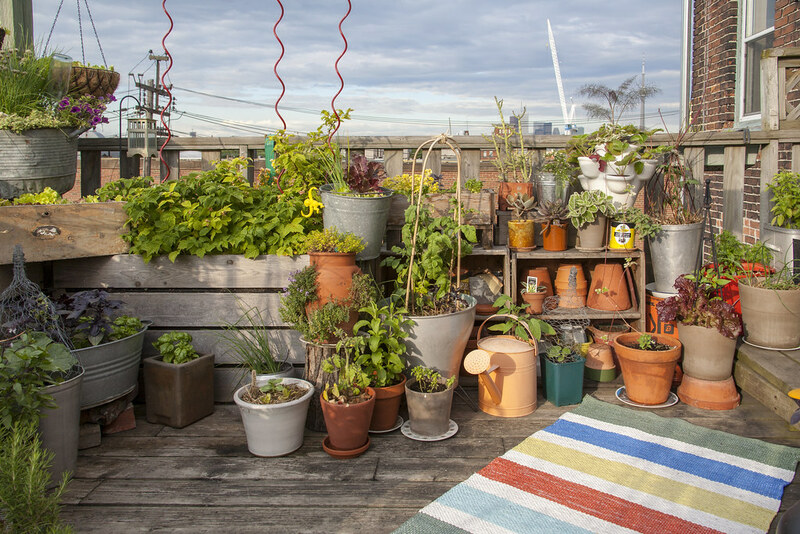 Brooklyn roof gardener Chris Phillips keeps about 15 containers—from small pots of coleus to huge planters containing large evergreen shrubs—on a 6-by-12-foot common roof deck atop his coop building. Many of Phillips’s neighbors hold cocktail parties and cookouts in the garden, which includes a dining table and chairs, so his focus is on creating a space for evening enjoyment. To that end, he avoids edible plants and instead grows decorative ones, especially those with white ﬂowers that are visible to nighttime visitors. Phillips has also had success with fragrant plants like lavender and roses. Roof gardens are a great way to draw people together, whether you’re the sole owner and use it for hosting guests or live in a shared building with dozens of tenants. Even a small number of plants on the roof can transform an otherwise barren space into an outdoor oasis. Add some solar lanterns, a deck chair or two, and a picnic table, and you may ﬁnd you never want to descend the stairs back to your indoor home. 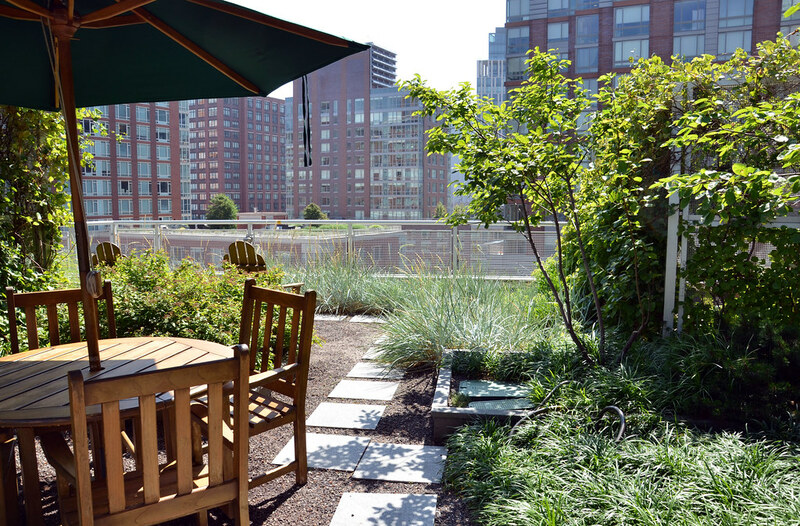 This article was originally published in Green Roofs and Rooftop Gardens (2010), part of the Brooklyn Botanic Garden Guides for A Greener Planet series. The weight of a roof top garden is not an insignificant issue. As an architect, I can’t think of too many existing buildings that have roof structures that were designed to take such loading. This website does mention it, but does not make it seem like its that critical an issue. Most roofs aren’t even designed to be “occupied” except for the occasional access for maintenance. Putting people, furniture up on a roof already exceeds the design load, but adding plants doubles, triples, quadruples that loading. A small urban rooftop container garden. Photo by Laura Berman. Low wooden planters are a good bet for windy rooftops. Photo by Tara Thayer. 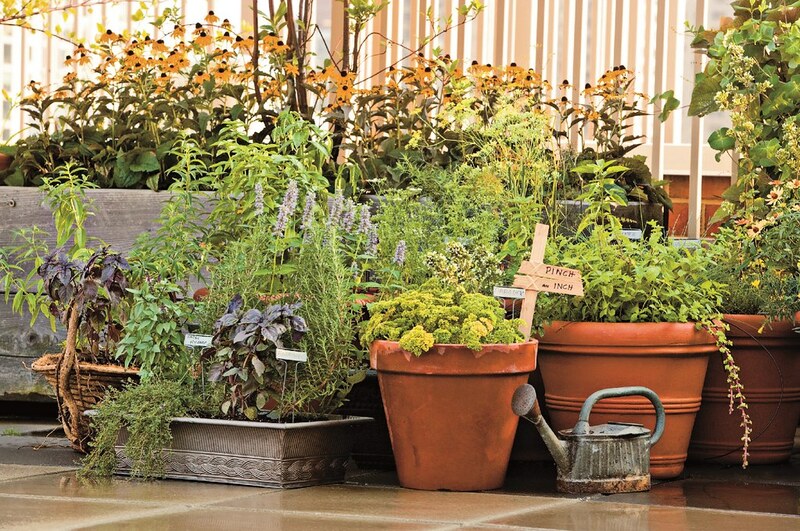 Re-purposed items like wading pools care good bets for rooftop container gardens. The stacked buckets have been fashioned into self-watering planters. Photo by Laura Berman. 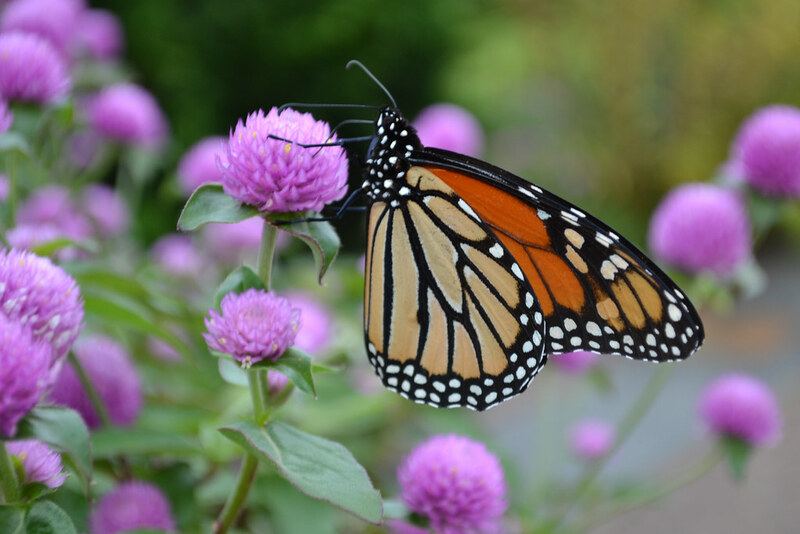 A passing monarch stops for a meal of Gomphrena globosa (globe amaranth) nectar. Photo by Elizabeth Peters. Ellen Spector Platt's sunny Manhattan rooftop garden produces enough salad greens and herbs for her to share. Photo by Alan and Linda Detrick. Just a few pieces of patio furniture are all you need to make your rooftop garden into a party venue. Photo by Tara Thayer. A wide variety of fruits and vegetables can be grown in a rooftop container. 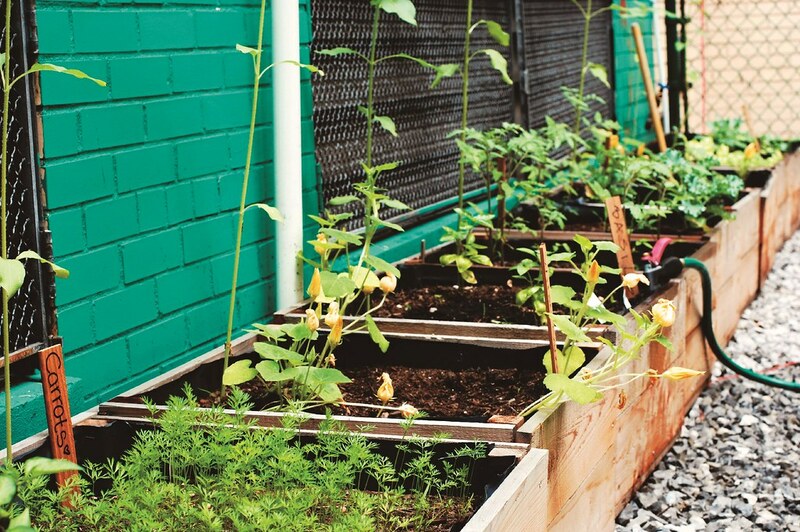 This Toronto rooftop school garden has yielded carrots, as well as peppers, lettuce, strawberries. Photo by Laura Berman.